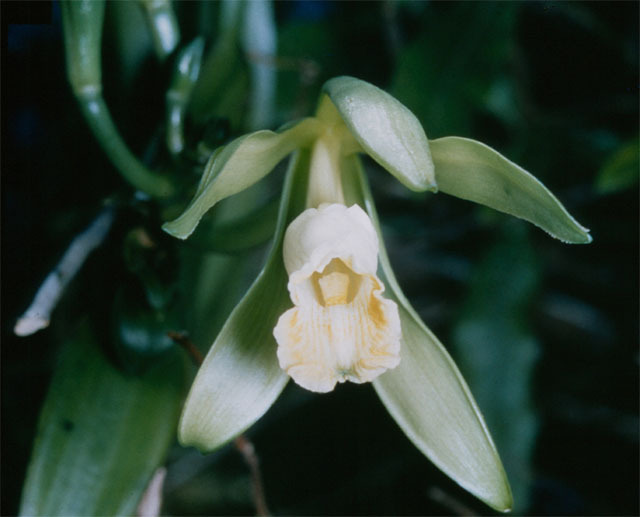 Vanilla (V. planifolia) is a species of orchid that is native to Mesoamerica. It rarely flowers, and when it does, pollination must occur within 12 hours of the flower opening to produce the coveted “bean” in which the vanillin compound is produced. In the wild, the Vanilla orchid has co-evolved with the Mexican Stingless Bee – the bee is the only known pollinator and resulted in Mexico being the only exporter of Vanilla until a process for hand pollination was discovered in 1841. Even now, there are only a few suitable climates for growing the orchid and planting to production can take upwards of 5 years, making vanilla second only to saffron in price of spices. So how did vanilla get north of Mexico? Well, Thomas Jefferson was introduced to the flavor while serving as ambassador to France. When he returned to the United States in 1789 he quickly learned that no one knew about vanilla. He then wrote to his contacts in France and had pods sent back to the states where the flavor quickly caught on. Instant Viagra! And probably better tasting although I have no data (anecdotal or otherwise) to back that claim up.